یوسف پور, حامد, اکبری موسوی, سید علی اصغر. (1395). بررسی ریزساختار، خواص سایشی و مقاومت به خوردگی لایه کامپوزیت سطحی برنج/گرافیت فرآوری شده با فرآیند اصطکاکی همزن. 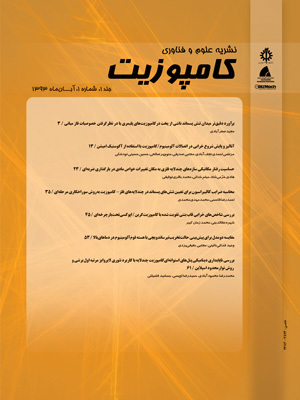 علوم و فناوری کامپوزیت, 3(3), 253-260. حامد یوسف پور; سید علی اصغر اکبری موسوی. "بررسی ریزساختار، خواص سایشی و مقاومت به خوردگی لایه کامپوزیت سطحی برنج/گرافیت فرآوری شده با فرآیند اصطکاکی همزن". علوم و فناوری کامپوزیت, 3, 3, 1395, 253-260. یوسف پور, حامد, اکبری موسوی, سید علی اصغر. (1395). 'بررسی ریزساختار، خواص سایشی و مقاومت به خوردگی لایه کامپوزیت سطحی برنج/گرافیت فرآوری شده با فرآیند اصطکاکی همزن', علوم و فناوری کامپوزیت, 3(3), pp. 253-260. یوسف پور, حامد, اکبری موسوی, سید علی اصغر. بررسی ریزساختار، خواص سایشی و مقاومت به خوردگی لایه کامپوزیت سطحی برنج/گرافیت فرآوری شده با فرآیند اصطکاکی همزن. علوم و فناوری کامپوزیت, 1395; 3(3): 253-260. در این پژوهش، یک لایه کامپوزیتی بر پایه آلیاژ برنج با ذرات تقویت کننده گرافیت با اندازه ذرات 7 میکرومتر توسط فرآیند اصطکاکی همزن تولید شده است. شیاری به عمق و پهنای 5/2 و 3/0 میلیمتر روی سطح یک نمونه از آلیاژ برنج با ضخامت 3 میلیمتر توسط دستگاه وایرکات ایجاد و توسط ذرات گرافیت کاملا پر شده است. فرآیند اصطکاکی همزن با سرعت چرخشی و سرعت پیشروی ابزار 800 دور بر دقیقه و 100 میلیمتر بر دقیقه تحت 1 و 3 پاس انجام شده و ریز ساختار و خواص مکانیکی قبل و بعد از فرآیند نیز بررسی شده است. مشاهدات میکروسکوپ نوری و میکروسکوپ الکترونی روبشی نشان داد که افزایش تعداد پاس‌ها منجر به توزیع یکنواخت‌تر ذرات خواهد شد. بیشینه سختی در لایه کامپوزیتی، حدود 141 ویکرز به‌دست آمد. این درحالی است که سختی زیرلایه تقریبا 84 ویکرز محاسبه شد. رفتار سایشی زیرلایه، لایه فرآوری شده بدون حضور ذرات تقویت کننده و لایه کامپوزیتی با ذرات تقویت کننده گرافیت با استفاده از یک دستگاه پین روی دیسک بررسی شد. نتایج نشان داد که مقاومت سایشی لایه‌های کامپوزیتی حاوی ذرات مولیبدنیوم دی‌سولفید تا حدود 5/1 برابر زیرلایه افزایش پیدا کرده است. نتایج آزمون خوردگی تافل نشان داد که پتانسیل خوردگی لایه کامپوزیتی با ذرات گرافیت نزدیک به مقادیر مربوط به فلز پایه بوده و تغییر محسوسی دیده نمی‌شود .در حالی که پتانسیل خوردگی در لایه فرآوری شده بدون حضور ذرات تقریبا 48 میلی ولت بیشتر از فلز پایه محاسبه شد. In this study, a brass alloy-based (Cu-30%Zn) composite was fabricated by Graphite particles with initial size of 7µm reinforcement via friction stir processing. Groove with the Width and depth of 0.3mm & 2.5 mm were made on the surface of a brass specimen, respectively and filled by Graphite powder. Friction stir processing was carried out with transverse and rotational speeds of 100mm/min and 800rpm, respectively and the tilt angle of 1°. Single pass and three-pass FSP were conducted on the samples. The microstructure and mechanical properties before and after FSP were investigated. Optical and scanning electron microscope observations revealed that increasing the number of passes exhibits homogeneous distribution of Graphite particles. The wear behavior was examined without lubricant and at room temperature using a pin-on-disc device. The results showed that the wear resistance of composite layers containing MoS2 particles has increased to about 1.5 times the substrate. Maximum hardness in the stir zone was 141 Vickers, while the hardness of base metal was 84 Vickers. TOEFL test results also showed that the corrosion potential layer composite with graphite particles near to the values of the base metal had no significant change. While the corrosion potential in the processed layer without reinforcing particles of the base metal is approximately 48 Mv. Meran, C., “The Joint Properties Of Brass Plates By Friction Stir Welding”, Materials & Design,Vol. 27, pp. 719-726, 2006. Novakovic, J. Vassiliou, p. Samara, k. and Argyropulos, TH., “Electroless Nip–Tio2 Composite Coatings: Their Production And Properties”, Surface and Coatings Technology, Vol. 201, pp. 895-901, 2006. Hiraoka, T. Nakamora, Y. and Tanaka,Y., “Mechanical Properties Of Cast Iron Surface-Hardened By TIG Arc Remelting”, AFS Transaction, Vol. 94-65, pp. 603-608, 2002. Park, C.G. Kim, J.G. Chung, Y.M. and Lee. C.H., “A Study On Corrosion Characterization Of Plasma Oxidized 65/35 Brass With Various Frequencies. Surface And Coatings Technology”, Surface and Coatings Technology Vol. 200, pp. 77-82, 2005. Park, H.S. Kimura, T. Murakami, T. Nagano, Y. Nakata, K. and Ushio, M., “Microstructures And Mechanical Properties Of Friction Stir Welds Of 60%Cu–40%Zn Copper Alloy, Materials Science And Engineering”, Vol. 371, pp. 160-169, 2004. Sathiskumar, R. Dinaharan, I. Murugan, N. and Vijay, S.J., “Influence Of Tool Rotational Speed On Microstructure And Sliding Wear Behavior Of Cu/B4C Surface Composite Synthesized By Friction Stir Processing”, Transactions of Nonferrous Metals Society of China, Vol. 25, pp. 95-102, 2015. Mishra, R.S. Ma, Z.Y. and Charit, I., “Friction Stir Processing: A Novel Technique For Fabrication Of Surface Composite”, Materials Science and Engineering, Vol. 341, pp. 307-310, 2003. Ahmadifard, S. Shahin, N. Kazemi, S. Heidarpour, A. and Shirazi, A., “Fabrication Of A5083/Sic Surface Composite By Friction Stir Processing And Its Characterization”, In Persian, Journal of Science and Technology of Composites, Vol. 2, No. 4, pp. 31-36, 2015. Dixit, M. Newkirk, J.W. and Mishra, R.S., “Properties Of Friction Stir-Processed Al 1100–Niti Composite”, Vol. 56, pp. 541-544, 2007. Moghaddam, M.S. Parvizi, R. Sabzevar, M.H. and Davoodi, A., “Microstructural And Mechanical Properties Of Friction Stir Welded Cu–30Zn Brass Alloy At Various Feed Speeds: Influence Of Stir Bands”, Materials & Design, Vol. 32, pp. 2749-2755, 2011.